Here’s Rob Garcia’s Soap Box performing the song at the Brooklyn Society for Ethical Culture last month. And the children were already embroiled in the trouble: about a week after the children’s strike parade in Ahmeek, a group of children in Centennial Heights “attacked the home of a non-union man” and broke several windows. 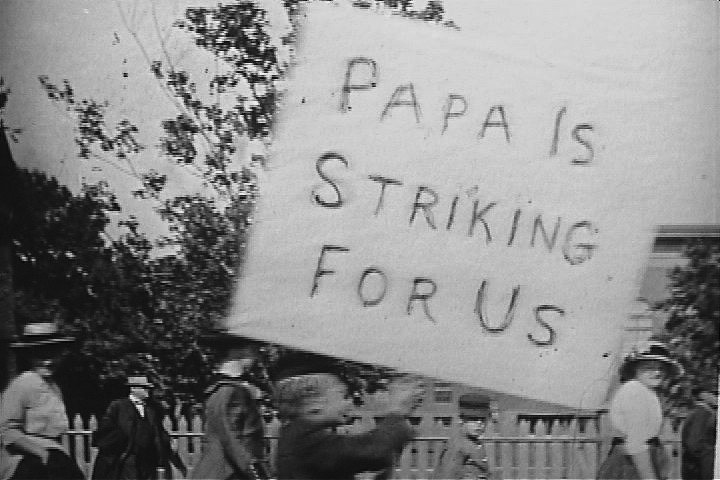 That marching boy with the hand-painted sign may have helped the WFM win sympathy for the striking miners, but it’s just as important to realize that he was actually in the fight — striking for papa just as papa was striking for him. 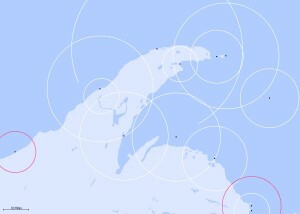 Children all around the Keweenaw were in it. Entire families were in it, whether they supported the strike or belonged to the Citizens Alliance or wanted nothing to do with either side. Everyone was in it. Mike Ragogna interviews Nora Guthrie today on Huffington Post about her father and his music. MR: Were there certain topics brought up in his material, such as the plight of the Mexican worker in “Deportees,” that resonated with you more than others? One hundred years ago today, in 1913, a crowd of almost 3000 people gathered in the sweltering heat at the municipal park in Hancock, Michigan for a Labor Day rally. It had been a difficult, violent summer, and there was no indication that the strike on the Copper Range was going to be settled anytime soon. Take some time to think about the theme and circumstances of Miller’s speech today. It seems to me a day dedicated to working people ought to be a day on which the basic human rights of all deserve more consideration than the property rights of the few. Brawling, spitting, cursing women — female furies loosed in the streets — came to stand for the social disorder that swept over Calumet in 1913. Local storyteller Jack Foster could think of no better way to communicate how bad things had gotten than to tell us, during the last interview we did with him, that in 1913 “you had women running around with brooms, dipped in the outhouses, slashing at you if you went to work. You can’t imagine what we went through here.” In Jack’s account, and in many popular accounts of the time, these women were something that ordinarily would be unimaginable. But these were extraordinary times. The word often chosen to describe the problem these women in Calumet represented — perplexing — suggests a difficult entanglement of social logic. Things had gotten all mixed up, confounded. The women fighting in the streets were defying authority in all senses of the word: not just the deputized and enlisted forces of law and order, but also the social forces that ordinarily kept women in their place, or at least prevented them from roving in bands and taking over the streets. We’re very happy to announce that 1913 Massacre will air on Twin Cities Public Television (tpt) over the 2013 Labor Day holiday. 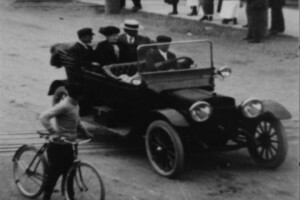 This is the first television broadcast of the film. On tpt Channel 2.1: Monday, September 2nd, at 11:00PM and Tuesday, September 3rd at 5:00AM. If you are in the Minneapolis / St. Paul area, we hope you’ll tune in. And if you have friends or family in the area, please let them know! Here’s a recent local news story about the changing of the Michigan historical marker at the Italian Hall site in Calumet. The sign at the site no longer says that the doors of the Hall opened “inward,” as it did for years. As author Steve Lehto sees it, the story of the doors opening inward developed over time, to help people explain, and cope with, what seemed an inexplicable event. Pete Seeger says in our film that Woody Guthrie took his version of events at the Hall from Mother Bloor’s autobiographical account of her years as a socialist organizer, We Are Many. Bloor had been working with Big Annie Clemenc and the ladies auxiliary to plan the party and she was there on Christmas Eve when the trouble started. She is careful to note in her account that “there were two doors to the box entry” of the Italian Hall, “both opening outward.” Here is the critical passsage from We Are Many. What happened was this. In the panic a man with a child in his arms had fallen at the bottom of the stairs. There were two doors to the box entry, both opening outward. When the man fell, the child in his arms fell through one of the doors, out into the street. The deputies, who had been threatening to break up the entertainment, were standing outside of the door. They themselves had raised the cry of Fire! and knew what was happening. Someone, it was never known who, seeing the man sprawling on the threshold, quickly closed the door, and both doors were held shut from the outside, so that no one could get out. One important variation he made was to change Bloor’s passive — the doors were held shut — to the active: the thugs held the door. That is a simple question, apparently. Almost anybody will say it is a thriving city up in the country where they blow open the earth with dynamite and wrest copper there from [sic] which makes some people rich and others strike. But the answer is not there. Calumet is a mirage city — it is here and it is not here. Calumet is the tomorrow of the country — it is always just ahead, yet it is not present. When you are in Calumet, you are in Red Jacket, but when you are in Red Jacket, you are not in Calumet. When you are in Calumet, you are in Laurium, but when you are in Laurium, you are not in Calumet. How would you answer the question now? The Michigan National Guard — over 2400 troops — were encamped near the Armory and in various locations. They conducted patrols, but were unable to keep the peace. Anyone carrying a dinner pail was likely to be attacked as a strikebreaker — spat upon, beaten, slapped around. There were shootings and somebody tried to dynamite the Red Jacket shaft. When a posse of deputy sheriffs arrived at a Hungarian boarding house near Wolverine, they were fired upon, doused with red pepper, scalded with hot water, and had to dodge a volley of household utensils, then surrounded by a crowd of angry miners. The deputies were able to escape when the militia men drove back the crowd with bayonets. 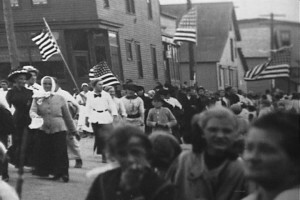 Mother Jones Arrives in Calumet – August 1913. I want you to use your brains, not your hands…Your masters want you to use your hands. I see they have the militia up here to take good care of you. The militia loves you dearly. You make the guns and the bayonets and they’ve got to be used on you. I’ve had experience with the militia. They’re not bad fellows. All there is about it, they put on dress uniforms and let you know they’ll clean hell out of you if you don’t do as they tell you. Washington and Lincoln didn’t want the militia. We didn’t have the militia in their days. We were Americans then. What’s the matter with you fellows? Why don’t you elect the right men to public offices? You elect these men and most of you take a glass of beer — scab beer — for your votes and let it sink into your groggy, scab brains. You did that and you elected a scab governor to bring out the militia and camp on company ground and take care of company property. This ground belongs to you. Don’t carry a gun or pistol. Let the other fellow do that. If he goes after you use your fists and black his two eyes and then he can’t see to shoot you. You don’t need to have a fight here. Just be firm and peaceful. They can’t operate the mines without you….Just use your brains and wake up to the fact that you have the power. The capitalists are organized, the doctors are organized, the lawyers are organized and the corporations are organized to skin you. Everyone’s been organized right along but you fellows. Militarism is becoming an atmospheric disease in America and you see the girls, the poor little things, talking and laughing with the soldiers who come to shoot their fathers. The stars and stripes shall float in Calumet and Michigan over free workingmen. Firm and peaceful were not exactly bywords of the day. There would be a fight in Calumet — a big fight. The scuffle at the Hungarian boarding house in early August was just a token of of bigger trouble to come later in the month. On August 14th, at the Putrich boarding house in Seeberville, where another armed posse had come to arrest another striking miner, Deputy Josh Cooper was struck in the head with a bowling tenpin. The posse opened fire on the men, women and children inside the house. Joseph Putrich and Alois Tijan were shot dead. John Stimac and Stanko Stepic were seriously wounded. This morning in Michigan’s Copper region, a miner’s strike broke out which, according to information received from various locations up to this point, has stopped work in all of the mines with few exceptions. The strike that began in late July of 1913 would last through the winter of 1913-1914. It would meet with strong opposition — sometimes violent opposition — and leave deep scars. The children’s party at the Italian Hall on Christmas Eve, 1913, was organized by women who supported the striking miners, and Woody Guthrie’s account of the Italian Hall disaster in “1913 Massacre” comes directly from one of those women: Mother Bloor. The stories told in our film, the survivor’s accounts of Christmas Eve, 1913, the tearing down of the Italian Hall in 1984 and the erection of the arch in 1989 , Woody’s discovery of the story in 1941, Arlo’s return to the place his father sang about — all those stories begin 100 years ago today. To mark the strike’s centennial, Daniel Schneider has published a beautiful letterpress edition of Työmies from the first day of the strike. The limited edition broadside includes the first-ever English translation of that text along with the original Finnish text. Schneider notes that “socialist-unionist perspective” presented in Työmies “differed markedly from that of the English-language kept press,” which tended to do the bidding of the mining company, Calumet and Hecla. If you are interested in learning more about this literary, historical and printing project, contact Schneider at tyomiesproject [at] gmail.com. 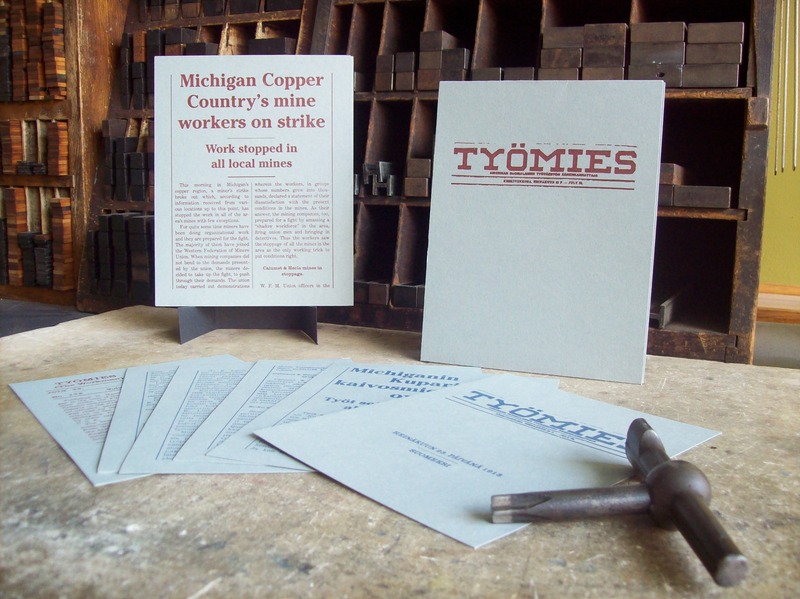 He’s selling a limited edition of the broadsides for $40 each and plans to use the proceeds to support future Työmies translation work and the restoration of letterpress printing equipment. And take a little time today to reflect on these headlines and the special perspective on the 1913 strike, the Italian Hall disaster and American history they offer.